It is quite natural for people to have goose bumps before facing a job interview. The short time span before the interview often causes a lot of tension. Job seekers are unsure as to what they should do during this period. Experts advise that candidates can look into a mirror or do some deep breathing to calm nerves before interview. The period before the interview is the time when you should let your entire focus on the interview and remember the important questions which you need to ask the interviewer during interview. The following mentioned are few job interview tips on how to calm down before an interview. Nervousness often makes people speak fast. Therefore, while you are waiting for an interview, breathe in through the nose and very slowly count till five. Then, breathe out through the nose after a count till five. Repeat this a number of times. Within that time period, you will be able to lower your heart rate and manage your breath too. You must also make sure that you maintain control over your speech and do not speak too fast to the interviewers. Stress is known to impact both your body and your mind. 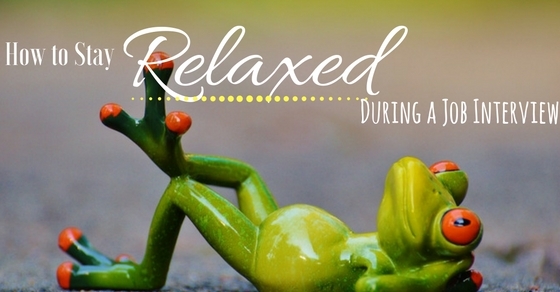 Your body releases stress hormones like cortisol and epinephrine when you are stressed. Depending on the level of stress that you experience, these hormones can hinder your ability to think clearly. Maintaining your cool during the period before the interview is essential to avoid this hormonal elixir so that you can think clearly. Squeeze your hips or thigh muscles. It is next to impossible to shake if either of the two regions is clenched. This method will make you feel more confident and your clothes will be able to hide your actions. Our body often shakes as a result of our emotions like anger or frustration. You must know how to keep these emotions in check. If that is not possible, atleast make sure that a third person does not get to know about your fear and anxiety. Open your throat by sticking out the tongue as far as it can go and try to speak something loudly. It will open the back of your throat and make you appear more confident. This needs to be done 10-15 minutes before the interview. There are only a handful of things that can make you feel shaky than coming late for an interview. Therefore, always reach the venue early. However, wait at a place somewhere close to the venue since it can create unnecessary pressure on the interviewer and start the interview on a wrong note. A good idea would be to reach the venue and relax in some café nearby. Head to the venue only when it is time for the interview. You may be taken to the boardroom where you will be made to sit. But don’t sit immediately if you don’t want to appear struggling out of the chair. Therefore, keep standing. It will help you maintain your confidence when you meet the interviewer. Some chairs are really uncomfortable and when you sit, standing up again can be a meticulous task. This may make you appear a bit out of place and odd. So avoid sitting on the chair. When you walk into the waiting room of the office, be courteous to the people who greet you, like the receptionist or security guard. So, it will be likely that the receptionist will report to the hiring manager that you were well behaved. The way you speak to people around you and the way you interact creates a lot of impression in the beginning itself. Make sure you are polite and choose the right words. Be willing to apologise for any wrong body language or mistake on your side. Never lean on the back of the chair as it can tighten your throat. Rather, lean a bit forward. You will look more dynamic as a result. How you sit can create a positive or negative impression on the interviewer. A negative body language lasts long in the minds of the interviewer. Many people are not aware of their negative body language. It is best to consult your friends and family members. Try to find out from them whether you have any negative body language. Get those postures and traits corrected. Be it your communication skills or knowledge, you need to decide on the one or two areas which will help you create a positive impact during the interview. Your first impression is what matters most. A relaxed attitude during the job interview is possible only when you put the best foot forward. So try and understand what you are best at. Try to use these best aspects to create a positive impression in the start of the interview itself. You shouldn’t use the time to rehearse your responses if you do so, your conversation will not look authentic to the interviewer. Trust what you know and the conversation will flow in due course. It is a good idea to prepare what you plan to speak. Read some good quotes or sayings that you may use during the interview. But avoid mugging up such sayings as these give you an artificial look. Deep breathing will help you in maintaining your calmness and reduce nervousness. Counting during the process of breathing is one of the most effective methods for calming the nerves. All that you need to do is to count till you reach 15, and repeat it once again. Breathing is known to relax you and increase the positive thoughts in you. Pranayama and many breathing exercises are suggested for people who are extremely anxious or excited. Experts have found out that a candidate has a higher chance of getting a job if he or she puts the hands on the table in front of the interviewer instead of hiding them under the table. Showing your hands signifies that you are an honest person. Often candidates try very hard to create a good impression while appearing for a job interview and end up speaking too high about themselves. The interviewer is likely to feel bored as you continue speaking about yourself without showing even the slightest interest in him or her. Always be ready to ask questions and show genuine interest in the interviewer’s reply. It is essential to look interested and passionate about the job you are applying for. But try not to boast too much about yourself to the interviewer during the conversation. When people are crippled with fear and want to escape any situation, they find it tough to listen and often tend to answer the wrong question. Therefore, try to slow down the natural responses of your body and listen to what the other person has to say. It will make the interviewer feel special and show that you value the question which you are being asked. It will also reveal that you are a good listener and help you create a good impression on the person who is conducting the interview. Your chances of clearing the interview will thus increase. If you are being yourself, then you will appear as someone who is relaxed, genuine and confident to the person who takes your interview. Try to stick to the words which you normally use. Therefore, try to enjoy the interview and take pride in your accomplishments. As you are already on the shortlist, the prospective employer may already think highly of you. Therefore, slow down, listen and be who you are. If you do that, you will come across as someone who is relaxed and confident, and clear the interview. Stress prevents you from taking the right decisions. Stress prevents you from performing the best during job interviews. There are many negative body postures that are revealed especially when a candidate is under stress. Excessive stress or anxiety may even make you fumble and affect the way you speak. The gist is that stress may make you lose the best opportunities that come your way. It is thus vital that you control your emotions and know how to overcome nervousness during interview. These tips will help prevent stress, calm nerves and help you stay relaxed during a job interview.